Hello there, I'm Bella from Miss Bella blogs. Today I am doing a guest post on the lovely Shona's blog for you all while she recovers. As it is the month of December (and Christmas!) I thought that I would do a winter inspired nail design. I wanted to do something a little different and give that little extra to the design so I sat down got out my nail polishes and got creating! 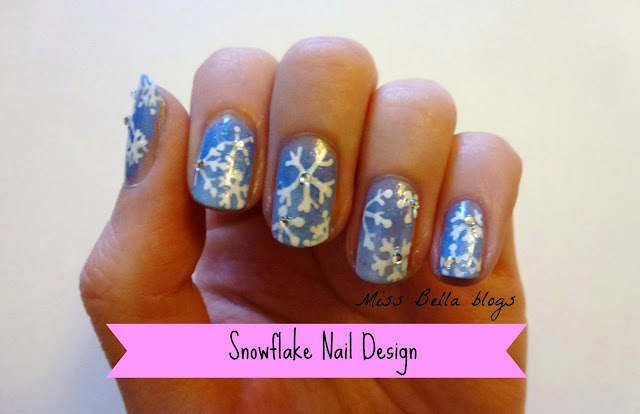 I started off with a blue ombre base, then when that was dry I used the white Barry M nail art pen to draw on the snowflakes. On top I used one of Essie's new top coats in 'pure pearlifection' which you can't really see very well in the photo but it looks so beautiful in person! To finish it off and add that extra bit of sparkle I put on some small nail art diamonds in the middle of a few of the snowflakes. I hope that you like this design and if you have a go at recreating it make sure that you tweet me a picture @MissBellablogs, I would love to see it! I would like to thank Shona for letting me guest post and if you liked it be sure to come on over to Miss Bella blogs and say hi. Thank you Bella for guest posting today and for creating a beautiful nail design to share with my readers! It is so pretty and I love the blue nail polish you used and the little gems! Don't forget to go over and take a look at Bella's blog once you've finished reading!